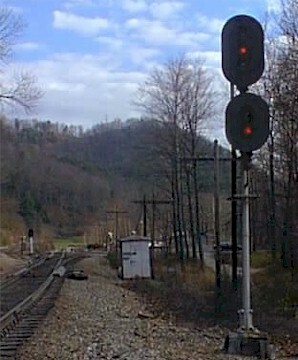 A double-headed signal at stop. Since the signal does not carry a number plate, the aspect means 'stop and stay'. 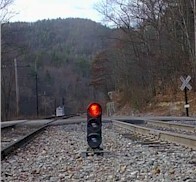 A low shunting signal at stop. 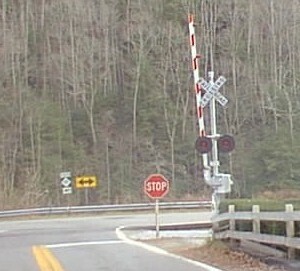 A U.S. level crossing. A German RR xing you'll see here. 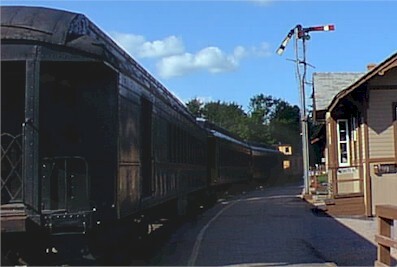 These pictures were taken earlier 1999 at the Mid-Continent Railroad Museum at North Freedom, Wisconsin. I would like to thank Michael Stokes for the explanation of the signals. 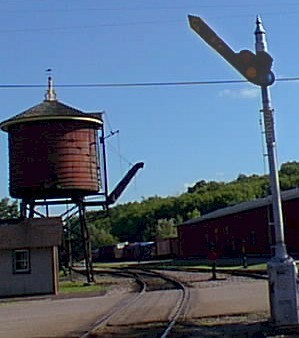 A semaphore signal near the main building. A point (Gringo: switch) signal for slower speed tracks. White is straight, and yellow would be for the curved track. Higher speed routes may also use green (straight) and red (curved). 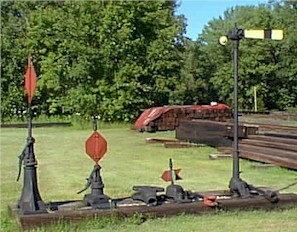 From left to right: Three point signals. 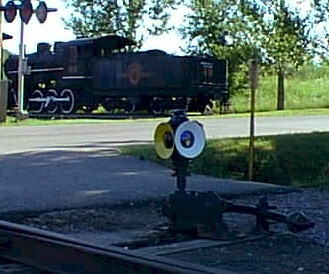 If the marker was visible, the point were set to the curved track. Otherwise the marker was aligned parallel to the line and hence not visible. The semaphore signal may have been a derailer signal, but I'm not sure. Another semaphore near the water tower.